You know what it’s like, you say you can’t do something or other, this or that, often enough, how you come to believe it and don’t even try? That’s how it was for me, Bob—about writing short stories—until about a dozen years ago, thanks to a chance encounter at an indie book store opening (Yes! They were still opening back then) with a fellow fallout from the music business, Jeff Gelb. Jeff had heard I was one or two published mystery novels to the good, so felt comfortable asking if I’d be interested in contributing a short story to Flesh & Blood: Guilty as Sin, a mystery anthology he was putting together with Max Allan Collins. I did a double take at Jeff’s invitation, expressed my appreciation, and declined. Okay, he had me there. “I’ll give it a shot,” I said, figuring, worst case scenario: I’d prove what I’d been claiming for years. When this happened in the sixties, the old Charlie Chaplin movie lot that hogged the southeast corner of Sunset Boulevard and La Brea Avenue had already passed through the hands of Red Skelton, the television clown, and become home to A&M Records for Herbie Alpert and his Tijuana Brass, Jewish hombres from Fairfax High who’d scored big with “The Lonely Bull” and turned Herbie into what the music business guys were calling a multibillionaire. I steered forward, guided by the same formula I had applied to my first novel, The Elvis and Marilyn Affair, the follow-up, The James Dean Affair, and the next in line, The John Lennon Affair, blending show-business truths I’d experienced over the years and full-out fiction in a way that made it a guessing game for the reader, an approach that’s pretty much become my trademark. What is it they said when poor, sad, drugged-out, fat-beyond-Brando Elvis popped one too many and crapped out on the floor of his toilet in Graceland? Good career move, they said. And a good career move the story became for me. They found what remained of the body, really not much more than a gunnysack of bones, on the old decaying Mabel Normand soundstage, a tall, narrow, triangular building easy to miss a block north of Sunset Boulevard in the low rent Silverlake area, where Effie Street collides with Fountain Avenue. And the writing came easier this time, once again no need to deal with sub-plots, secondary characters, other story elements that all too often add length, not strength, to a novel. The soundstage was the least important landmark in the neighborhood, surrounded as it was by the outdoor location of Griffith’s monumental Intolerance—now a supermarket—the Monogram Studios, where Leo Gorcey, Huntz Hall and the Bowery Boys turned out dozens of cheap movies—now home to a PBS TV station—and the ABC television lot up the street at Prospect and Talmadge, but once a picturesque hillside owned by movie star Norma Talmadge, where Rin-Tin-Tin ran movie after movie to rescue the three Warner Brothers and their Vitaphone pictures from bankruptcy. 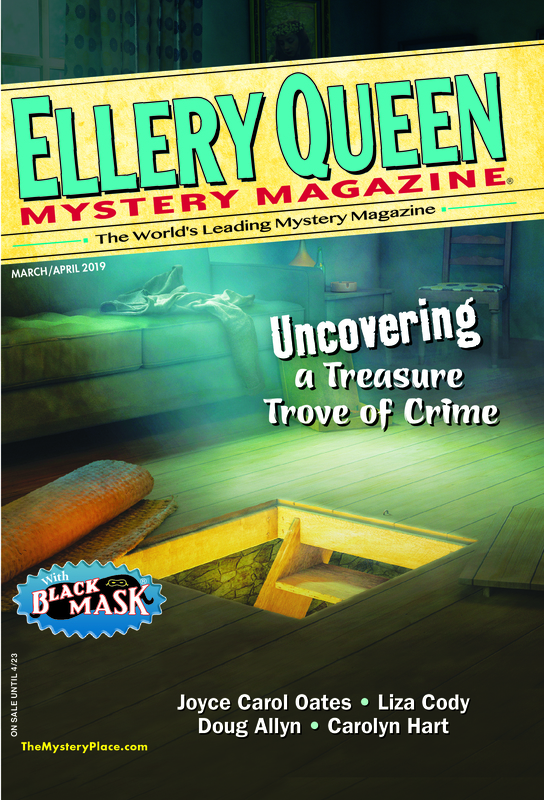 I was sufficiently pleased with the story that I decided to gamble, forget about Sisters in Crime, and submit it to Ellery Queen’s Mystery Magazine, until now nothing I’d ever figured as a possibility. For whatever ego comes with acceptance, there’s always a lesson to be learned by rejection, so—what the hell!—nothing to lose by taking a run at the queen of short mystery fiction publications. And editor Janet Hutchings bought the story. Ran the story in the December 2003 issue and—wonder of wonders—put my name on the cover, alongside my voracious-reader daughter Deborah’s absolute favorite author of short stories, the dean of Queen regulars, bless him, Edward D. Hoch. My name on the cover. Take my word for it and you don’t have to answer. I began filling my writing time between novels with short stories that freed me from the hardcover prison of a mystery series, if not necessarily from some of my series characters who had developed a fan following. There was often a place for them in story ideas that began with What if? and helped me stretch as a writer, crafting answers to the question inside the box and, as often, outside the box. Janet continued buying my stories, and I sold others to Linda Landrigan, editor of Alfred Hitchcock’s Mystery Magazine, Queen’s sister publication. Queen readers voted me onto their annual poll of favorite stories three times running. Stories have been reprinted in annual anthologies each of the past seven years, often the collections co-edited by the estimable Ed Gorman and Martin Greenberg. Robert J. Randisi came calling for original contributions to show business collections built around Hollywood and Broadway. Gary Phillips invited me in for a title he was editing in the Akashic series of noir publications. Sounds to me like you’re starting to go heavy on the bragging rights. Actually, I’m heading to make a point, Bob. A few years ago, aware the L.A. chapter of Sisters in Crime was putting together another anthology, I wrote a story expressly for them, feeling some quirky sense of guilt for that early short story career boost the chapter unknowingly, indirectly gave me—my way of saying thank you. Hold on, Bob. Are you about to tell me your story was rejected? Bob, take my word for it and you don’t have to answer. This entry was posted in Books, Fiction, Guest, Writers and tagged elleryqueenmm, fiction, literature, short stories, writers, writing_technique. Bookmark the permalink. And, Bob, you don;t have to answer, but your stories are always the highlight of whatever magazine they appear in. I turn to them first. What an enlightening tale of “never say never.” and please send my thanks to Jeff Gelb for giving you a push that has led to lots of entertainment for me. Great post, Bob. Thoroughly entertaining and informative. Thank you.